While all educators deserve our respect and gratitude, two of Brevard College’s graduates from the teacher licensure program have done some amazing things in their careers thus far. Brevard College’s Teacher Education has been fully State Accredited since the beginning of academic year 2009. Since that time, the program has graduated over 90 licensed teachers in over 9 different licensure areas. Many remain in NC teaching, however, some are teaching throughout the United States including Texas, California, and Florida. One of the most recent graduates is teaching History in Jerusalem. And for the first time, one of BC’s teaching graduates Lori King, will be a cooperating teacher for one of the College’s teachers this fall. But that’s not all first grade King has done in her brief four- year tenure working for the Henderson County schools. This past spring, she was able to raise funds to support special programs in her classroom. 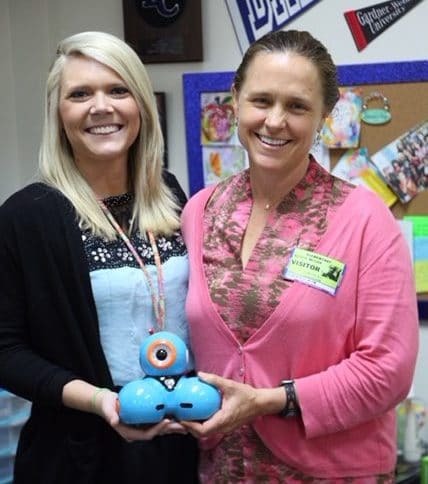 For one such effort, King attracted matching funds from General Motors and brought two programmable robots into her classroom. Through this STEAM initiative, students learned a bit about robotics, developed sequential thinking and problem solving skills. Another BC alumna, Michelle Miller, came to teaching from a slightly different direction. Heading back to school after starting a career in accounting, Miller has been teaching for 5 years already. When asked why, Miller stated “I looked around my cubicle one day and decided, after 20 years, I needed a change.” So Miller enrolled in the BC program’s inaugural year and the rest, as they say is history…or 5th grade math, as the case may be. Miller gravitated towards the older grades as she said she gets to provide a bit more instruction and a bit less handholding. Building on her experiential education at BC, she said she does as much as possible beyond just using the assigned textbooks. For example, to teach a lesson on weather, Miller says she takes the students outside and has them “look up”. “I try to find ways to make what we learn ‘real’,” says Miller, of her approach to learning. “A lot of my students don’t have a lot experience with nature or doing things outdoors. I am so excited to get to show them!” In addition to having her teaching certificate, Miller also has an environmental educator’s certification. As part of this requirement, Miller created a nature trail and garden for the school. King recently presented at a national conference in Columbia where she illustrated integrating fairy tales with STEAM (STEM plus Art). She developed a lesson plan using the children’s story the Three Billy Goat’s Gruff. In this approach, students don’t only get to hear the story, but they also connect engineering design (the bridge,) strategic planning (how the goats avoid the ugly troll who hides underneath the bridge,) empathy and sympathy by discovering the synergies between each character, among other things. As an add on, these first graders also got a lesson in prioritization as they built a bridge and had to understand that building the structure’s foundation had to be considered first before the bridge’s decoration or aesthetic appeal was determined. This past year, Miller was “Teacher of the Year” at Sugarloaf Elementary School. “ It’s awesome being selected ‘Teacher of the Year’,” says Miller. “There are a lot of phenomenal teachers here at Sugarloaf, and I am moved by the fact that others voted for me. “ Next year, Miller has been selected to participate in an internship as an assistant principal as part of her Master’s Program. In that role, Miller looks forward to making a difference by helping teachers build relationships with their students. King’s and Miller’s school, Sugarloaf Elementary, is a “Leader in Me” school. Started by teachers, The Leader in Me is Franklin Covey’s whole school transformation process. It teaches 21st century leadership and life skills to students and creates a culture of student empowerment based on the idea that every child can be a leader. Brevard College is committed to an experiential liberal arts education that encourages personal growth and inspires artistic, intellectual, and social action. To learn more, visit brevard.edu, “like” Brevard College on Facebook and follow @BrevardCollege on Twitter.